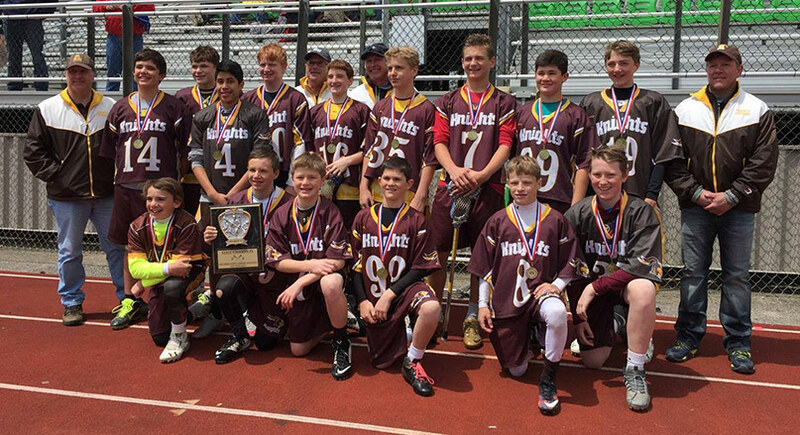 The follow account of the South Dayton Catholic Knight’s 2016 Ohio Middle School Lacrosse State Tournament experience was provided by Jim Thorson, one of the team’s coaches. We arrived at Dublin Scioto High School on a cold and windy day for the middle of May. We thought we might dodge the rain so we set up a couple of tents in preparation for a meeting spot between games. We would never use those tents. We played the first game at 3:30 pm on grass with temperatures in the high 40’s and 20 mph winds, wet grass and horizontal rain. We played Westerville Blendon and won 5-3. The game was not that close, we just didn’t play well enough to take advantage of a lot of scoring opportunities. Matt Schimpf (Incarnation) finished with a hat-trick. In between games it continued to rain, hard and sideways. We all just huddled in our cars and drank hot chocolate. This was a season that almost wasn’t. Bernie Holtgreive had to recruit a couple of kids just to get our roster to 13. We also occasionally relied on 5th and 6th graders to shore us up. We started out well going 2-0 and then wet fields and Spring Break prevented us from practicing or playing a game for two weeks until our loss to Bellbrook 3-1. At the end of the season our rematch with Bellbrook was canceled due to weather. Bellbrook’s coach told me we had the best defense and goalie they had played all year. We next lost to Beavercreek in the last minutes 5-4. We played well, much improved. Then came 3 games in the Moeller tournament at Moeller High School. The kids warmed up as described above but came out and lit up Elder, winning 6-1 with good ball movement and transition play. It was hot that day and we camped out between games. It was a good bonding day. Parents were great, kids had fun. We then played LaSalle and had the most beautiful half of the season. We scored 7 goals mostly off of transition fast breaks with perfectly executed clears and pinpoint passes. When they were on the bench at half we told them we have nothing to say, get some water and repeat. We won 7-4 with kids in positions they don’t normally play, still playing well. More camp time then we played Moeller on the big field. We were tired going in with only 14 boys. We played our first game at 1:00 pm and it was now 5:00 pm, it had been a long, hot day. We played toe-to-toe with this team, which angered the Moeller coach into getting a technical foul. It was 4-2 at half. We tied it up then Moeller went up by one. It was 20-minute running clocks with only one timeout per half, we were gassed but had the ball with the clock winding down and a man up. I made the mistake of calling a timeout as they kept the penalty time running during the timeout, which makes no sense, but that was the deal. We lost the ball coming across mid-field, they scored on a fast break to make it final at 6-4. Still it was a great day, our boys played well and we were just as good as Moeller’s B1. This tournament was a turning point as our ball movement and offense came alive and we learned to quit worrying about their warm-up. The boys definitely had confidence afterwards. We played Mason’s B1 at Mason on a wet grass field. It was tied 3-3 late in the 4th and with 15 seconds on the clock, check that, time ran out and 5 seconds later they scored on a fast break. They counted it, but that game was really a tie. We won our final three games of the season with a 3-0 win in our rematch with Oakwood, an 11-1 win over Little Miami and a 7-2 win over Springboro’s B1 at Springboro. We were 7-5 going into the State Tournament. Westlake came out and looked a little shaky early but then got rhythm and moved the ball very well, with good passes and movement. They had a boisterous sea captain looking coach that was parroting our missteps at every move and commanding his team. Overall, they played better than us but we kept matching them. We went down 2 early in 4th quarter but Joel Bockelman (Bishop Leibold) scored 2 goals to tie it. The game went to overtime and after 4 minutes we went to a second 4-minute overtime, still tied 4-4. My thought at the time was “this is bad” as Westlake took advantage of such situations. I think it was on the very first possession (I may be wrong about this) Joel Bockelman (BLS) stole a pass to a cutter maybe 5 yards from the crease. It was a ninja-like interception, really great reaction. I figured we might have a chance to kill the penalty but he took it the length of the field and put a spin move around a defender, shot ¾ underhand and scored, winning the game in sudden death. Hat-trick for Joel to win the game! It was unbelievable. We all simply went nuts. I can’t remember a feeling like that in a sports setting in my lifetime. I have chills now writing about it. The Westlake parents were very gracious and congratulatory. Many also said it was one of the best lacrosse games they’d seen at any level (probably not all of the play but the drama). The next morning at 8:00 am we played Cincinnati Christian Academy on the same turf field. It was still windy and low 40’s but the sun came out and it didn’t feel as bad as the previous day. CCA were good and organized as well. They had THE most obnoxious parent who was basically trying to coach from the stands, really annoying. We went into the half down 2-1. I don’t exactly remember if we went down 2 early in the 3rd quarter but then we went on a scoring tear. Tim Janess (Incarnation) started it off and we scored 5 goals (Tim Janess 2, Matt Schimpf 1, Danny Thorson (Bishop Leibold) 1, Mason Henry (Bishop Leibold) 1) on 3 assists (one each from Braden Cox (Incarnation), Danny Miller (Incarnation) and Danny Thorson). Both teams scored 2 in the 4th and the final was 8-5. We were in the Championship game! In between games our kids were laying on the grass in the sun without a care. Wadsworth, the next opponent, was up on the hill passing and getting ready for the game. We played Wadsworth at 11:00 am. It was 10-minute quarters and our fourth game in less than 24 hours, which would take a toll on our short roster. We went up 3-1 in the 1st quarter. We were up 5-1 with 20 seconds in the half and they won a face-off and scored to make it 5-2 at half. I felt pretty good. We looked really good. Trevor Towery (Bishop Leibold) had 9 saves in the first half, mostly on outside shots, but good shots. He was fantastic. No scoring in the 3rd quarter and I think we only took one shot but our kids were getting gassed. Wadsworth took advantage of our fatigue in the 4th and scored 3 goals to tie it up with about 6 minutes to go. We were also getting a little panicked. I don’t remember what the clock was at the time but we then had consecutive penalties and were two men down. We somehow survived without giving up a goal. Our kids were really worn out at this point. Around the 2-minute mark we scored with a nice assist and shot by Danny Thorson to Joel Bockelman. It was Joel’s second goal of the game and, ultimately the game winner. Our kids had nothing left in the tank at the end but held strong for the win. Trevor Towery had 9 more saves on a real shooting assault in the second half for a total of 18 saves. I am so proud of this group of boys. It was an honor to coach them and I think we put them in positions to be successful but it wasn’t coaching that won the games – it was the boys. It is probably the last sport I will ever coach with my son so to go out like this is a fairytale ending for me and, I think, for the boys and coaches. But, I think the person that was most excited after the double over-time win was Matt Eckerle and he doesn’t have a kid on the team. I will never forget this weekend.